We went to the Living Planet Aquarium in Sandy last Wednesday with Kids on the Move (an early intervention group that is helping Kaidrei with speech therapy). I cleared off my camera so I'd be able to take pictures only to find out when I tried to take the first picture at the aquarium that my battery was dead. I guess it is time to invest in a second battery so I have a spare. 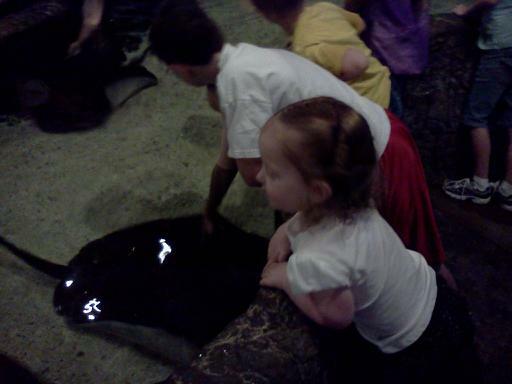 Kaidrei's favorite part was the sting ray petting exhibit. She actually ran off twice to go back after we had left. The second time I was surprised she was able to find it because we had left that part of the aquarium and she ran back in a different way than we had ever gone. 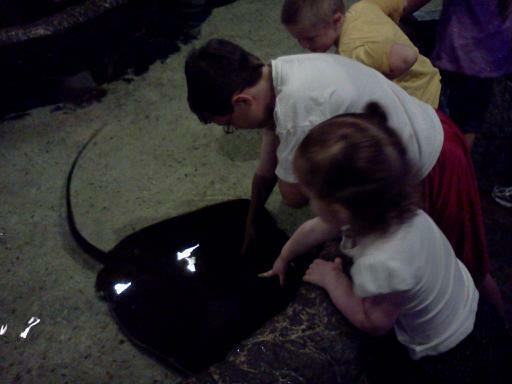 Trying to pet a stingray. Her arms were actually too short to reach them, but one came up on the side and got her arm when she wasn't looking. She thought it was pretty funny.